This menu is for the Auditor's Office. Use the left side menu to access the main menu for CharlestonCounty.org. Disclaimer: This estimator is designed to give the taxpayer or prospective buyer an estimate of property taxes for a parcel of real estate, personal property or a motor vehicle. The results will be based on a few parameters the user enters. 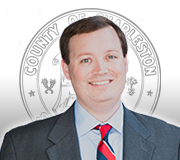 This is in no way intended to be a final tax bill and the Charleston County Auditor’s Office in no way shall assume any liability for any error or inaccuracies. As always, if you have questions it is best to contact the office directly. Select the correct assessment ratio from the Assessment Ratio drop down: 4% for a primary residence, 6% for a non-primary residence or other real property or a motor vehicle, 10.5% for personal property.